The 2011 Hyundai Equus comes available with just about every feature available to keep its passengers spoiled like rear seats that have massage functions and a cooler in the center console to name a few. If you are interested in a Hyundai Equus, Hyundai will send a salesperson right to your door and either take you for a test drive or let you take the Equus full-size luxury sedan for a drive by yourself. 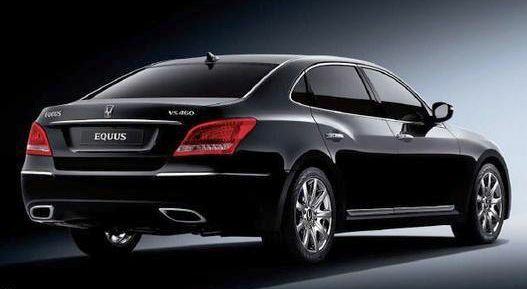 The 2011 Equus will be sold in 2 trims, the Signature model and the Ultimate model. The signature model of the Hyundai Equus is very well equipped with these features: Air suspension, adaptive cruise control, 19 inch alloy wheels, lane warning system, real wood interior, suide headliner, Lexicon surround sound stereo and premium leather seats. The 20111 Hyundai Equus Ultimate model has everything the Signature trim does and it adds these features: power trunk lid, 8 inch rear monitor, front wide-view camera, cool storage box, power headrest, rear seat vanity mirrors and best of all reat seat with power lumbar, leg support and shiatsu massage function. With all of the above features that are also offered by the Hyundai Equus’s competitors like Mercedes and Lexus, you would be paying at least $85,000 to $100,000. However, to buy the 2011 Hyundai Equus it will only cost you from $58,000 to $70,000 this may strike a cord with those more value minded luxury car buyers in the current economic environment. The weight distritbution of the Equus luxury sedan is 52/48 front-to-rear and the chassis has ample use of high strength steel in crucial areas to offer rigidity for this large sedan. To propel this large luxury sedan forward the 2011 Equus uses Hyundai’s Tau 4.6 liter DOHC V8 engine which runs on both regular and premium gasoline. Tested with premium petrol the Equus 4.6 liter engine put out 385 hp and 333 lb/ft of torque, on regular gas the output was 378 hp. This is more horsepower than Lexus LS460, Mercedes S550 and the Audi A8. The transmission is a six-speed ZF automatic that has Shiftronic manual and can take the 2011 Hyundai Equus from 0-100 km/h in 6.4 seconds. Pulling 2000 kg of luxury sedan is not easy, however the Equus seems to do it surprisingly well. You don’t need to be skeptical anymore about the handling performance of higher end Hyundai cars, the company has done their homework and can now boast the same technology and actual handling response to that of BMW and Mercedes. Electronically controlled air suspension comes standard and allows the driver to select the suspension modes. The center transmission console has a drive mode switch that allows either Normal or Sport mode. With variable-effort steering assist the 5.1 meter long Equus full-size luxury sedan is fairly easy to turn and manoeuvre and park. For parking there are both audible and visual parking assist features. The front suspension is a five-link design and the rear uses Continuous Damping Control system which actively senses road conditions and changes damping force automatically. Sticky P245/45R front and P275/40R tires offers great grip and control, these are mounted on 19 inch chrome alloy wheels. The standard list of features is really long, but here are a few key features to mention. 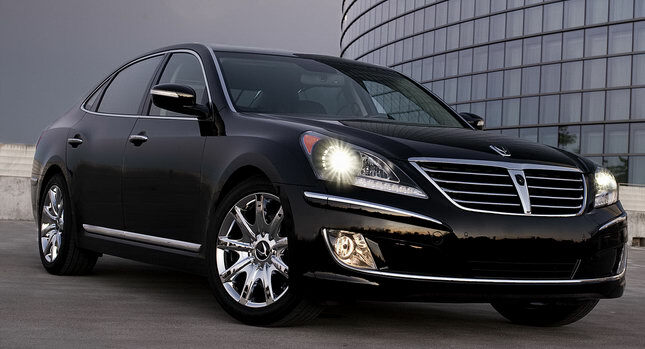 As far as safety goes, the 2011 Hyundai Equus has got you covered. There are 2 front airbags, 2 front and rear seat side-impact airbags and roof mounted curtain airbags on either side and a nifty driver knee airbag. Just like how Honda and Toyota build their brand to a higher level where they can introduce their luxury brands, Hyundai is following suit and if history is an indication then the likes Lexus, Acura, BMW, Audi and Mercedes should take note, because the Hyundai Equus is going to eat their lunch in the future.